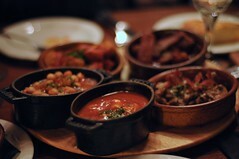 Tapas are little plates of tasty Spanish food; meats, cheeses, seafood, grilled vegetables, olives, etc, often quite salty or garlicky or oily or all three (but in a good way). Some dishes are served hot, others at room temperature. They can be eaten as appetisers (one or two dishes per person) or as a full meal (between three and six dishes per person depending on appetites) and are usually shared among all the diners in a party. Last edited 2008-04-02 21:58:24 (version 4; diff). List all versions. Page last edited 2008-04-02 21:58:24 (version 4).